The genus name Mezammira suggested by Gogala, Puissant and Trilar (2017) appears to be unavailable Dmitriev (2017) and therefore the genus name Oligoglena (our second choice) should be used instead of Cicadivetta or Mezammira. It is now used also in our website for species O. carayoni, O. filoti, O. flaveola, O. goumenissa, O. iphigenia, O. sakisi, O. tibialis and is valid for non-european species O. parvula, O. popovi, O. sibilatrix, O. turcica as well. At the end of the year 2017 we changed the whole site and now all the videos in form of oscillograms or spectrograms (sonagrams) are played back as YouTube streaming videos. Resurrection of the genus name Mezammira and description of two new species. Genus name Mezammira should be used as new combinations for small cicadas till now known under the name Cicadivetta report Gogala, Puissant and Trilar in a new paper PDF. This concerns the former species C. flaveola, C. tibialis, C. goumenissa, Tettigetta carayoni and some non european species. Two new species of the genus Mezammira are described from Grece, M. filoti and M. sakisi. In the recent paper of Hertach et al. (2016) Complex within a complex... about a hidden diversity of Cicadetta brevipennis s. l., the taxon C. petryi Schumacher was reassigned to species level, newly described were subspecies C. b. litoralis Puissant & Hertach and C. b. hippolaidica Hertach. New species Cicadetta sibillae and a new subspecies C. anapaistica lucana of the complex of mountain cicadas were recently described by T. Hertach & T. Trilar and T. Hertach rsp. and are added to the site. New photos of Cicadetta montana, C. cantilatrix, C. cerdaniensis, C. mediterranea, Cicadivetta tibialis, Tettigettalna argentata, Tettigettula pygmea, Tibicina haematodes, T. steveni, Cicada orni, Lyristes plebejus by T. Hertach were added. Cicadatra icari and C. karpathosensis have been described by Simoes, Sanborn and Quartau from Greek islands.Their songs and other data are added to our pages. New photos and a new pdf added! New photos by S. Puissant are added to the pages of C. atra, C. brevipennis, T. argentata, T. garricola and T. tomentosa. And a new pdf is added to corresponding pages. A new species of [url=http://]Cicadivetta goumenissa with high frequency song has been discovered in the northern part of Peloponnese, Greece. The song of [url=http://]Pagiphora aschei, known from the island Krete but also from Antalya in Turkey, has been recently described. Cicadetta dirfica, a new species from C. montana complex and a new genus and species Euboeana castaneivaga[/i] have been described from the island of Evia, Greece. Thomas Hertach discovered a new species from Cicadetta montana complex in Sicily. It is closely related to C. cerdaniensis but has clearly different sound pattern of calling song. New genera, species and songs from southern Spain! S. Puissant & J. Sueur published recently an important paper with descriptions of 3 new species, one subspecies of Cicadettini from southern Spain. In the same paper they introduced 4 new genera replacing the formerly used genus Tettigetta: Tettigettalna, Tettigettula, Tettigettacula and Pseudotettigetta - with the keys based on morphology and acoustics. The new endemic taxa are: T. armandi, Tettigettalna boulardi, T. defauti and a new ssp. : T. helianthemi galantei. There are also descriptions of songs of the following cicadas: Tettigettacula baenai, Tettigettalna aneabi and Tettigetalna helianthemi. A description of the acoustic signals of Tettigetta carayoni from Crete (Kriti) has been published (Trilar T. & M. Gogala 2010). During last decades it became evident, that the song patterns of singing cicadas are very species specific and enable us to detect a presence of most species in a habitat without seeing and collecting them, just by recording and analyzing their acoustic emissions. In addition to this, one can recognize the hidden, morphologically inconspicuous species by analyzing and comparing their songs. As it is well known, in singing cicadas only males have characteristic sound producing organs - tymbals and are able to produce loud and species specific sound signals. Nevertheless, females of some species can answer to the courtship signals of males by short wing clicks. Similarly, males of some species use wing clicking as additional sound producing mechanism. 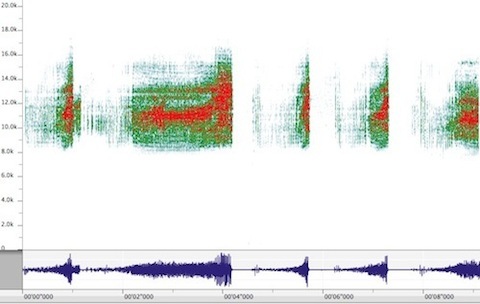 Oscillogram (below) and spectrogram (sonagram) of the calling song of Euboeana castaneivaga, produced by Amadeus Pro software. On our pages we prepared samples of songs for comparison in MP4 format reformated through the VPO (Virtual publishing office) software into FLV files (shown by Flash player). For graphical comparison of song patterns we are providing oscillograms, spectrograms - (also called sonograms or sonagrams) what means a 3-dimensional presentation of sound intensity in a frequency versus time plain. For this purpose we originally used Canary 1.2.4 (Cornell University) and recently Amadeus Pro software (© Hairersoft) for Mac computers. SnapzProX software (© Ambrosia Software) has been used to produce QuickTime or RealPlayer mov files and for conversion to MP4 the MPEG Streamclip 1.9 ©. Since the end of 2017 we use Screen Record Pro © software for this purpose. However, since most of browsers nowadays do not support anymore flash plugins we decided recently (2018) to get the help of the YouTube service and now the oscillograms and spectrograms (sonagrams) are played back as embedded streaming videos.